The greatest obstacle of any character or person is the climax of the journey, the moment of desperation, that all-in moment. It’s the moment when we ask “Will he survive this?” or “Will he emerge victorious?” Hollywood has desensitized us to this, to some extent by making every character win in the end, but more on that in a minute. This is the moment in the journey that has to be so bleak that we (the audience or those witnessing it) are just not sure if the character or person is going to succeed or even survive. The ultimate example of this is Easter - Christ’s resurrection from the dead. Jesus was dead. The Scripture makes this clear in John 19:34 when the solider pierces Jesus’s side and blood and water comes from the wound. His disciples are downtrodden and all seems lost. But Jesus emerges from the tomb. He is raised from the dead and overcomes the ultimate. Hallelujah! On the baseball field, this journey is occurring on some level throughout a season for every player. Everyone faces a series of difficulties, often coming to a head late in the season. 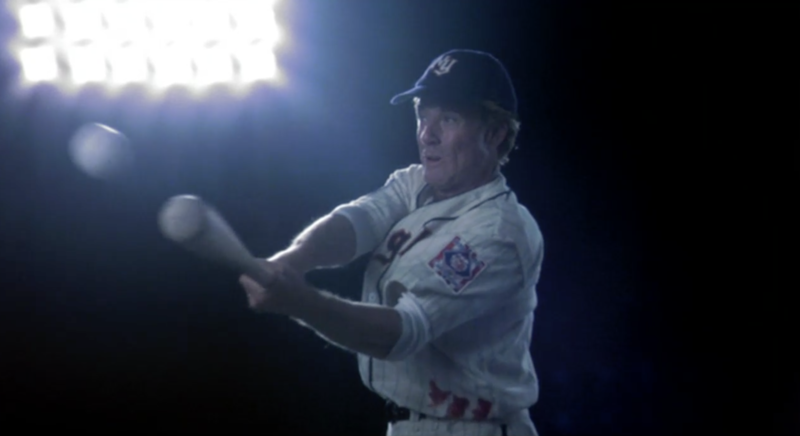 Sometimes it even looks like Roy Hobbs from The Natural. His bat has been broken, his weapon vanquished. He’s bleeding from the side, the wound he suffered earlier in his journey (those wounds look different for every player, but they’re always there). There’s a young fireballer on the mound looking to grab the mantle of fame. It’s a beautiful picture of a climactic moment on a baseball field, and we see it all of the time. Now, and here’s a spoiler alert of all spoiler alerts, the best part of The Natural is largely unknown. While Hobbs succeeds in overcoming his greatest obstacle in the movie, he fails in the book. Can you believe that? What an incredible juxtaposition of the same character! The filmmakers paint the classic picture of Hollywood success, while the author (Bernard Malamud) provides a very human picture of what so many experience in baseball. The amazing thing is that both stories work. In the words of another wise baseball sage, “Sometimes you win. Sometimes you lose. And sometimes it rains.” This is true in the game of baseball and in some of the great journeys of life. Thankfully, at the end of all of it, for those who acknowledge Christ as Lord, we know that through Jesus’s resurrection that we will all share eternal life with Him. That represents the ultimate journey for all of us.